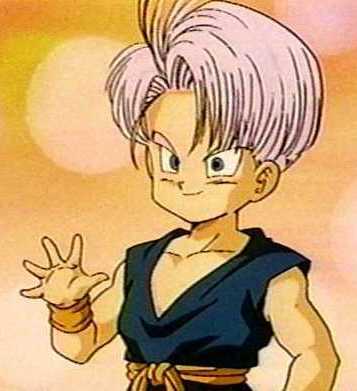 Trunks (トランクス, Torankusu) is the half Saiyan, half human son of Vegeta and Bulma. He is the best friend and fusee of Goten and brother of Bulla. His alternate timeline counterpart is Future Trunks. Trunks has light purple hair, and blue eyes that are shaped like Vegeta's. He inherited hi 'Trunks'Added by Ava558s father's facial features and tanned skin. His hair turns blonde and his eyes turn (pupil-less) green when he becomes a Super Saiyan. Present Trunks usually wears a dark green gi, an orange belt, orange wristbands, and the same golden boots that Future Trunks wears. He is the only male Saiyan in the series to not have black or brown hair. Present Trunks is shown to be very cocky and belligerent like Vegeta, as well as mischievous, most likely due to the fact that Trunks grew up with his father Vegeta and enjoyed the luxuries of peace, while his alternate timeline counterpart grew up without Future Vegeta and in an apocalyptic world. Trunks tends to usually take control over the younger Goten, stating to him numerous times how he is both older and stronger (during childhood). Trunks at first also has his doubt about Goku, whom he originally believes is not as strong as his father. Later on, Trunks does gain more respect for Goku after seeing Goku's Super Saiyan 3 power in action. 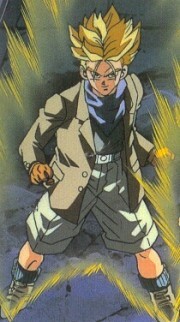 In his later years, Trunks adopts a personality similar to his future counterpart's. During and in between his battles at the World Martial Arts Tournament, he acts just like his father does, calm when he fights and insults his opponents. He doesn't act like this however during his battle with Goten because it is a battle he could possibly lose. However, they do talk during the battle, assuring their opponent that he won't win. Trunks seems to really enjoy fighting as a child. This is apparent because of how much he wanted to become world champion, ten years after Kid Buu's defeat Trunks seems to not care about fighting anymore. The events of Dragon Ball Z: The History of Trunks tell the origins of Future Trunks' story. Thirteen years have passed since the deaths of Goku and the other Z Fighters. Trunks is seen as a 14 year old boy being taught by a 23 year old Future Gohan. Tragically, Gohan is later murdered by the android twins 17 and 18, which however sparks Trunks' first transformation into a Super Saiyan. Three years later, Trunks attempts to battle the twins, but fails miserably and is nearly killed. Six months to a year later Bulma completes the Time machine and Trunks heads twenty years into the past, with hopes of finding a way to break the apocalyptic grip the artificial destroyers have on his future. 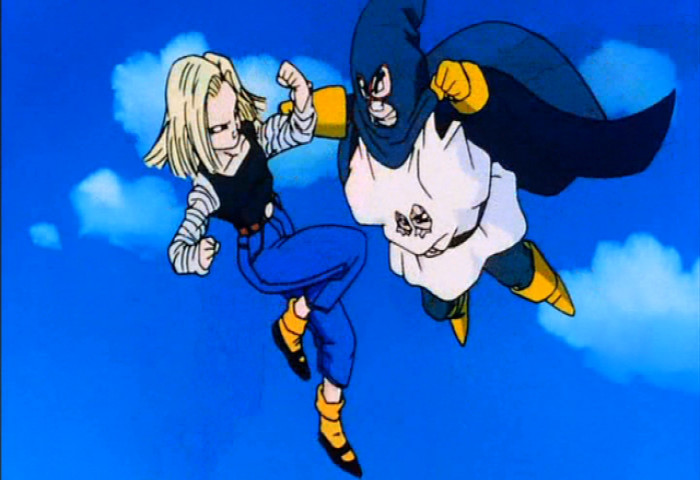 Trunks fights the androids often and usually has Gohan's help. 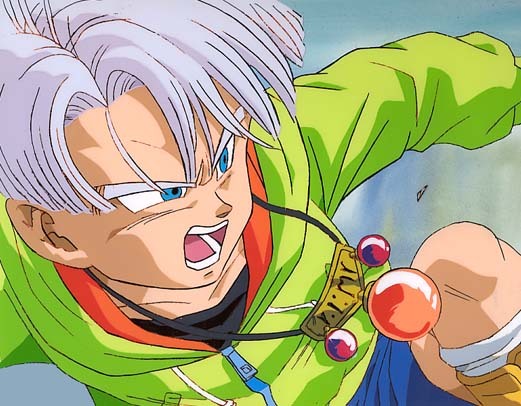 Mirai Trunks during the fight with Imperfect Cell.Added by MsBulmaIn Dragon Ball Z, Trunks first makes an appearance in the series as his 17 year old alternate future counterpart. Upon arrival, Trunks transforms into a Super Saiyan and easily defeats Frieza with his sword and his father King Cold with a powerful ki blast. He, along with the other Z Fighters, then await for Goku's return to Earth. Once Goku arrives, Trunks tells of the horrors that will soon unfold. He explains that in three years, on the morning of May 12th at 10:00 a.m., two tremendously powerful androids will appear, kill all of the Z Fighters, and will reign destruction upon the earth for nearly two decades. He also tells of Goku's death from a heart virus six months before the androids attack. After giving Goku an antidote for the virus, Future Trunks takes his leave back to his time. Three years later, in the Androids Saga, both future and present-day Trunks make an appearance, both as an infant and as a teenager. Future Trunks, along with the other Z Fighters, have the main roles An upset Trunks crawling on his father VegetaAdded by Gotekof defeating the androids, and eventually the evil Cell. After Cell's defeat at the hands of Super Saiyan 2 Gohan, Future Trunks returns to his time much more powerful than before, and effortlessly kills both Future Android 17 and Future Android 18. He also killed First Form Cell in his timeline. After Future Trunks had destroyed the androids and Cell, he continued living peacefully with his mother. Seven years after Gohan killed Cell, present Trunks takes a much larger role. Trunks is eight years old and fantastically strong for his age. He was trained by Vegeta over the years, though at some unknown point of time he transformed into a Super Saiyan while play-sparring with his best friend Goten. His Super Saiyan transformation is first shown on-screen while he is training in a Gravity Room with Vegeta, where he transforms out of nowhere and leaps around naturally in gravity that at first was supposedly overwhelming him. This comes as a massive shock to Vegeta considering his young age. Trunks at the World Martial Arts TournamentAdded by IceMoonCloudIn the Junior Division of the 25th World Martial Arts Tournament, Trunks makes it all the way to the grand finals and becomes the new junior champion by defeating his best friend Goten, the second son of Goku and Chi-Chi (by cheating and becoming a Trunks fight Goten in the World Tournement.Added by GotekSuper Saiyan when they agreed not to in the tournament, though Goten had done the same thing earlier in the fight). When Trunks is set up against Mr. Satan, Satan tells him to only lightly tap in on the face, knowing how much power Trunks has. However even Trunks' light tap is enough to launch Mr.Satan from the ring, allowing Trunks to win the match. However, the crowd thought that Mr. Satan did it deliberately to be nice to Trunks. Truniks and Goten then compete in the adult division disguised as Mighty Mask, but Android 18 realizes this by sensing their two unusually strong power levels and blows their cover with a Destructo Disk while in the match, disqualifying them. Shortly after Trunks learned about Majin Buu from Videl, he tries to help his father battle the monster, but he and Goten are knocked out by Vegeta who blew himself up to try to destroy Majin Buu, albeit failing. The boys are taken to Kami's Lookout to take shelter from Majin Buu. When they wake up they learn that Vegeta and Gohan are dead. Goku tells them about the fusion dance to defeat Majin Mighty Mask (Goten and Trunks in disquise) fight against 18Added by IceMoonCloudBuu. Babidi makes an announcement to the world that if Goten, Trunks and Piccolo don't come out of hiding they are going to destroy West City. Trunks must rush to Capsule Corporation to get the Dragon Radar. Goku intercepts Babidi and Majin Buu, and shows them Super Saiyan 3 form. Majin Buu and Goku fight while Trunks gets the Dragon Radar. Later, Trunks returns the Lookout with the Dragon Radar and shows Goku his respect. Then, Goku shows them the fusion technique and, only in the anime, shows them the Super Saiyan 3. However, Goku's time on Earth is ended and he leaves Piccolo to teach the boys the rest of the Fusion dance. Everyone on Kami's Lookout says goodbye to Goku as he leaves with Fortuneteller Baba to the Other World. In the Fusion Saga (a subset of the Buu Saga), Trunks and Goten fight Majin Buu, both separately and by joining together into the temporarily-fused being Gotenks, but with a couple of failed attempts. Trunks can be a bit of a Trunks and Goten as Super Saiyan right after defusing from GotenksAdded by Gotekspoiled brat at times, but this is probably only due to the fact that he has spent a great deal of time around Vegeta, and has unconsciously adopted his father's cocky attitude (and low opinion of Goku; this changes when Trunks witnesses the Super Saiyan 3 form for the first time). Trunks seems to have developed a habit of mocking and mooning his enemies. After being set free from Super Buu, Trunks is killed when Kid Buu uses the Planet Burst attack and destroys the Earth along with Goten, Piccolo and Gohan. Trunks as he appears at the end of Dragon Ball ZAdded by IceMoonCloudTrunks is later revived by the Namekian Dragon Balls, and lends energy to Goku's Super Spirit Bomb. He and Goten also get a group of people to lend a hand as well. Trunks is later seen at a party at his home. 10 years pass, Trunks is forced by Vegeta to compete in the 28th World Martial Arts Tournament. Trunks is not seen competing in this tournament, due to Goku and Uub's leaving the competition at the end of the series. At the beginning of Dragon Ball GT, Trunks has become the President of Capsule Corporation. However, although it pays quite well (so well that he can afford his own chauffer and servants), he does not like the job and its overwhelming responsibilities, and will often slip out the window and fly away. Trunks in Dragonball GTAdded by GotekTrunks goes on a journey with Goku and Pan in a spaceship designed by Bulma. Later, a piece of the ship falls off and Goku, Trunks, and Pan are forced to crash land on the planet Imecka to get the parts needed to repair the ship. Trunks as a Super Saiyan in GTAdded by GotekGroups of merchants then swarm Trunks and the others to the point that they take refuge from them in the Gold Star Hotel. They then realize they are being charged every second for everything in the hotel. They escape without paying and stumble upon the house of an old couple and their children. They talk about Don Kee the ruler of the planet and how he mistreats his rule, just then Don Kee's men come and repossess the old couple's house saying they where behind payment. Goku suggests that they go and fight Don Kee but the couple says that is impossible because of his grand army. On their way back to the ship Trunks drops the Dragon Radar and it is swallowed by the small robot T-2006 nicknamed Giru who says that he can't give the radar back to them because it is already integrated into his system. Meanwhile Goku notices the ship being dragged away by Don Kee's men. He tries to use Instant Transmission to teleport them to the ship but after two failed attempts realizes that he can't use it in his small body. They are forced to travel to Don Kee's palace on foot to recover their ship. Pan decides that they will use a stealth operation to recover the ship and would only result to fighting as a last resort. After briefly sneaking around a large rock falls on Trunks' head and Giru starts making noises that alarm the guards. The guards open fire on the group. Pan jumps in the carrying car while Goku moves the ship onto the car and Pan drives the ship out of the palace with Goku and Trunks. But while escaping, Don Kee's henchmen Gale and Sheila fire a ki blast at Goku who reflects it back with ease towards Ledgic, Don Kee's right hand man, who recognizes them as Saiyans. Goku and the others escape but Trunks says they have to go back into town for more parts due to Pan's Trunks and Goku on Planet Luud.Added by Gotek"reckless driving". Once they reach the town everyone hides and Trunks finds the three of them on Imecka's most wanted list. While running from Don Kee's men they fall into the house of a nice old couple who offer them food after realizing Goku and company mean no harm. They say that Don Kee made it a law that no one is allowed to own a ship so that no one would escape the planet including the old couple. Pan gets fed up and convinces Goku and Trunks to go face Don Kee head on. They turn themselves in to the police and get brought to the palace. Once there Goku and Trunks and Pan incapacitate Gale, Sheila, and all of Don Kee's guards. Then Goku blasts his way into Don Kee's throne-room. Don Kee sicks Ledgic on the fighters after capturing Pan in an energy chamber. Ledgic says that he will fight Goku but for his own satisfaction. After a short fight Goku defeats Ledgic and they take down Don Kee and make him give everyone free rent and give them back their ships free of charge. Plus Don Kee gives them the parts they need for free and they leave Imecka. They then land on an unnamed planet where everything is larger than life. They finds the Four Star Ball in the tooth of a giant and they go to the next planet. On planet Gelbo they find the Six Star Ball in the hair of the princess of the village, Leena. Trunks asks for the ball but her finance Doma said that they where in a large problem already. The amphibian creature Zoonama would keep on terrifying the village, if they didn't give him a wife. The villagers had agreed on Leena for his bride. Goku, Trunks, and Pan decide that they will help them out in exchange for the Dragon Ball and they agree. Pan comes up with the idea to disguise Trunks as Leena. Zoonama comes and takes Trunks to his lair. Trunks gets Zoonama tipsy and Goku arrives with Pan and Doma. Doma cuts off Zoonama's left whisker with a huge pair of scissors and as he cuts off the left one Zoonama awakens in a drunken rage. He begins to wiggle his whiskers and an earthquake begins to come, but stops soon after, while Zoonama continues to wiggle his whisker. Pan realizes that he can't cause earthquakes, but only predict them. But, now he is so tipsy, that he didn't realize that the quake was over. Suddenly a really big earthquake erupts and Goku and the others leave the cavern with Zoonama, because they are under a volcano that is starting to erupt because of the earthquake. Goku stops the huge volcano with a Kamehameha Wave, saving the village, and winning the Dragon Ball. Just as he goes to get the ball, Bon Para, one of the mysterious Para Brothers, arrives and takes it. Trunks then jumps in the ship with Pan and Goku and they chase after the Para Brothers. The brothers trick them onto the asteroid of Beehay inhabited by huge bloodthirsty worm-like creatures called Mouma. The Para Brothers escape and fly to planet Luud. They go to Cardinal Mutchy Mutchy who tells them that they have failed and that Trunks has another Dragon Ball on his ship that they failed to get and they must go retrieve it. They travel back to find Goku and the others and they get hypnotized by the Para Para Boogie until they are saved by the hungry Mouma. Pan goes aboard Para's ship to find the Dragon Ball that they stole. She accidentally activates the auto-pilot and is brought to planet Luud. There she is captured and turned into a doll Trunks on Planet Rudeeze.Added by Gotekfor the evil lord Dolltaki. Goku shows up with Trunks and kills Cardinal Mutchy Mutchy who reveals that he is actually two parts, the body and the whip which transforms into Mutchy and fights Goku. Trunks finishes Mutchy off with the Flash Bang and saves Goku from Mutchy's whip-like arms. Then Dolltaki turns everyone except for Trunks, himself, Goku, and Pan into dolls and feeds them to the machine deity Lord Luud. Dolltaki then awakens Luud who takes him and Pan inside of Luud's body to gain their energy. While Luud fights Goku and Trunks Pan forces Dolltaki to tell her the weakness of the seemingly invincible Luud. Dolltaki reveals that Goku must strike the outside of Luud's mechanical heart while Pan strikes the inside at the exact same time. After multiple tries Goku and Pan finally succeed and destroyed Luud freeing all of the people. Trunks then takes back his Dragon Ball and they leave the planet. On planet Pital, Baby possessed Trunks a brief moment, but Trunks drived him out by transforming into a Super Saiyan, which removed Baby from his body. In fact Baby, only wanted to place an egg in Trunks to be later Trunks under Baby's control.Added by Gotekactivated on Earth. As a servant of Baby, Trunks helps to power him up to defeat Goku on Earth. On the reconstituted New Planet Plant, he, Goten, and Gohan try to save their new lord from Uub, who seems to overpower him. However, Baby was just playing with Uub, and blasts his slaves into unconsciousness for their interference. Trunks is the first to be cured by the Sacred Water, and after being cured, he along with Gohan and Goten help to restore the energy of Super Saiyan 4 Goku so that he can finish off Baby. Trunks appears to have inherited his mother's fascination with technology. He gets distracted by the gadgets on the hospital planet, allowing Baby to sneak up on him. This turns out to have been a plan to lure the villain into a trap however, as Goku, Trunks, and Pan could sense Baby's ki when he got excited about hunting them. 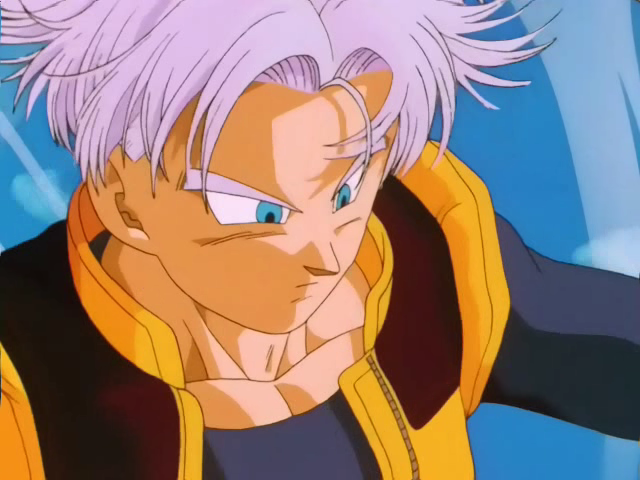 Trunks in the Super 17 Saga.Added by GotekA year later, Trunks observes the 30th World Martial Arts Tournament, due to the fact that it was too late for him to compete. A month later, Trunks is ambushed by a brainwashed Android 17. Trunks joins up with Goten, Majuub, Pan, Gohan and Vegeta to fight countless villains who have escaped from Hell. Trunks, then joins the fight against Super 17 but is unable to defeat him even with the help of Gohan, Goten, Majuub, and his father. When Black Smoke Shenron shows up to the Z Fighters, Trunks is shown attempting to calm his mother after Old Kai claimed she was responsible for Black Smoke Shenron's existence. Later, against Syn Shenron, Trunks tries to restore Goku's energy once again along with Goten and Gohan. After the dragon transforms into Omega Shenron and Super Saiyan 4 Vegeta suggests he and Goku fuse to defeat him, Trunks along with Gohan, Goten Trunks during the battle against Omega Shenron.Added by Gotekand Majuub tries to hold off Omega long enough for Goku and Vegeta to fuse. They are successful and Goku and Vegeta form Gogeta, however Gogeta defuses before he can finish Omega off. Later on when Goku is presumed dead by Omega Shenron, Vegeta decides the earth's best bet is for him to try and defeat Omega Shenron while everyone else escapes. Before sending them off, Vegeta requests that Goten, Gohan, Trunks continue the fight if he fails. The three half-Saiyans say goodbye to their families and decide to go back to help Vegeta in the fight but they are all easily defeated. However they do succeed in distracting Omega long enough for Goku to charge his Universal Spirit Bomb which destroys the Shadow Dragon. Trunks is last seen telling Pan that the Dragon Balls will come back after the Earthlings have proven they can take care without them. Trunks' first movie appearance is in a brief scene during Broly - The Legendary Super Saiyan, where he is seen being held by Bulma as a baby. He also appears in Bojack Unbound, still as a baby. Added by SuperSaiyanSimbaDuring Broly - Second Coming, Trunks takes one of the main roles as he and Goten battle the awoken, enraged Broly. Despite putting up an impressively decent fight against the Legendary Super Saiyan, they are eventually defeated, only to be saved by Gohan. In Bio-Broly, Trunks and Goten once again team up to battle the cloned version of Broly, Bio-Broly. The two young Super Saiyans eventually defeat the clone by using the ocean water to dissolve him, finally putting an end to the monstrous Saiyan. Trunks also makes an appearance in Fusion Reborn, where he and Goten team up yet again to stop the evil villains that had returned from Hell. They most notably battle The Dictator, a Dragon Ball version of Hitler. In Wr Trunks with Tapion's sword.Added by SuperSaiyanSimbaath of the Dragon, Trunks befriends the hero named Tapion, who, after Goku defeats the evil monster Hirudegarn, gives Trunks his sword, even saying it was Trunks after Goku beats Hirudegarn.Added by Nappa77always meant for him, (in reference to Future Trunks' swordsmanship). This sword is then later seen in the intro of Dragon Ball GT, but it was never used in any episodes. Ki Blast – The most basic form of energy wave. 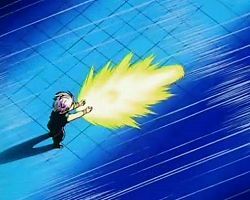 Kamehameha – Trunks never displays the knowledge of how to use this attack in the original manga series, however he displays this skill in the movie Dragon Ball Z: Bio-Broly, and later in Dragon Ball GT. Trunks most likely learned the attack from watching Goten or Gohan using it or by shared knowledge during his time fused with Goten as Gotenks. The Legacy of Goku series gives him his own unique version of Kamehameha called Flame Kamehameha where Trunks fires a Kamehameha like wave composed of fire and flails it around like a Trunks using his variation of the Final Flash, the Big Tree CannonAdded by SpiritBombwhip. Big Tree Cannon – Used in the World Tornament saga. This attack is similar to Vegeta's Final Flash, though scaled down in power. He performed an attack similar to this against Goten in the World Martial Arts Tournament. It is debatable whether this is the same attack. This is attack is also known as the Double Buster in the Budokai series. Levitate – The ability to fly using one's ki. Fusion Dance – The ability for two beings to become one. Trunks performs this ability many times with his friend, Goten, temporarily creating the being, Gotenks. Flash Bang – Used in GT to kill Mutchie. It looks similar to Vegeta's Big Bang attack except pure white instead of white and blue. 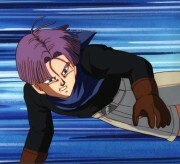 Buster Cannon – Trunks gathers energy in each of his hands and forms it into a large ball, pulls it back and fires at the opponent. Burning Storm – Used against Baby on planet Pital. God Breaker – Used during the Super 17 Saga. Super Explosive Wave – Trunks charges up his whole body with energy and then releases that energy into a giant explosion to cause serious damage to any opponents caught inside the explosion. He used this attack to try to stop Omega Shenron so his father and Goku can do the fusion. Ki Sense – Trunks can sense life energy. Full Power Energy Barrage Wave – Trunks first used this against Broly in Dragon Ball Z: Broly - Second Coming. Kikoukenjutsu Sword Style – Trunks and Goten founded this sword style and many of its techniques (which are seen in Dragon Ball Online). Trunks gains the power to become a Super Saiyan at a very young age. 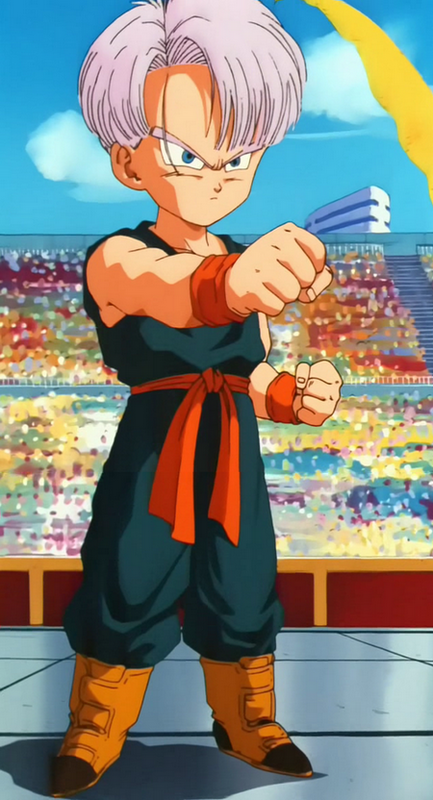 He uses this form to fight Goten in the World Martial Arts Tournament. Gotenks is the fusion created when Goten and Trunks perform the fusion dance. Gotenks' power far surpasses either of the fighters' individual strengths, as he attains not only the Super Saiyan form, but also the Super Saiyan 3 form. In music, the song "Chīsa na Senshi~Goten to Trunks no Theme~" by Shin Oya focuses on both Trunks and Goten. It is revealed in the MMORPG Dragon Ball Online that Trunk and Goten open their own martial arts school based on swords in Age 805, the Kikoukenjutsu Sword School. The school teaches the principle of channeling ki energy through swords to increase strike power. Their discipline has become one of the most praised disiciplines on Earth as of Age 1000. 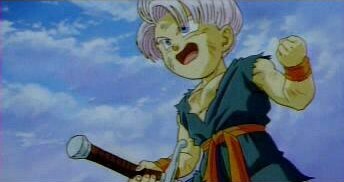 Trunks has shown interest in swords since he was young, as in Age 774 (in the movie Dragon Ball Z: Wrath of the Dragon), a hero named Tapion gave his sword to Trunks. Trunks and Goten's Kikoukenjutsu Sword School help in defeating the remnants of the Planet trade organization who attacked Earth in Age 820. Trunks' last name is Brief, which is Bulma's last name. On the other hand, it is unknown if Saiyans like Vegeta have last names. Trunks' grandfather, Dr. Brief, made him a toy that looks like the time machine Future Trunks arrived in. He also had a Goku doll. His unusual name comes from the running joke of his family members all being named after various undergarments, though these are downplayed in the English anime, and the word "trunks" can have several meanings, such as plural for tree trunk (interestingly enough, he uses an attack called Big Tree Cannon). The English dub of Dragon Ball Z has his name as Trunks Brief (Torankusu Burifu) while the Dragon Ball GT dub identifies him as Mr. Brief during Trunks appearances as President of Capsule Corp. Bulma does actually refer to him by this full name in the anime. His name, Trunks, is a pun on boxers. When it is put together, it becomes Boxer-Brief. Trunks has no tail that transforms him to a Great Ape in times of a full moon. Akira Toriyama has stated that this is because the tail is a recessive trait. In Dragon Ball Z: Bio-Broly, Trunks is shown to be highly intelligent for his age, as he displays uncanny knowledge of Lord Jaguar's biotechnologies and the Bio-Warriors. When this is noted by Goten, Trunks states, "I come from a scientific family, Goten. It's really no wonder where I get it." His favorite food is yakiniku, the Japanese word for grilled meat. Trunks has a fear of dogs (as he said in Dragon Ball Z: Bio-Broly, "Goten I have a problem with dogs"). In the original manga and in Dragon Ball GT, Trunks' hair is a darker shade of a purple. In the Dragon Ball Z anime, Trunks' hair is in a lighter shade. His hair is also sometimes shown as dark silver, light silver, or white. The hero of the video game Dragon Quest Monsters: Joker bares a striking resemblance to Kid Trunks. The game's artwork and character designs were by Toriyama. 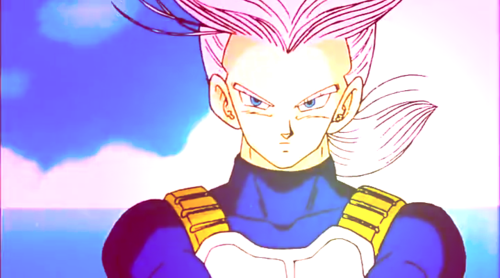 Otokosuki seems to be attracted to Trunks as he can be seen admiring Trunks as he passes by during the Black Star Dragon Ball Saga of Dragon Ball GT, where he is now an employee of the Capsule Corporation. 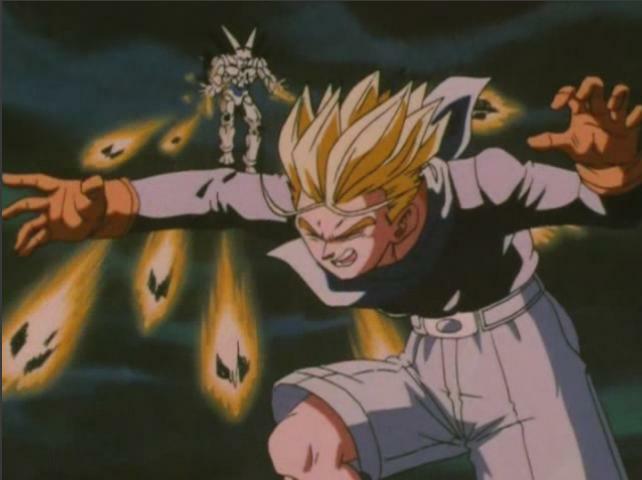 As mentioned before, Trunks inherited both Vegeta's egotistical attitude and his father's low opinion of Goku, as seen when Goku arrives on Earth for his one-day revival pass granted by Fortuneteller Baba, where he and Vegeta look upon the emotional scene of Goku reunites with his friends and family and meets Goten for the first time with total indifference. While believing his father to be the best, Trunks does respect Goku as a warrior after witnessing his Super Saiyan 3 transformation, and in Wrath of the Dragon, is shown to express genuine concern for Goku's well-being after he is crushed in between Hirudegarn's hands. Trunks gets wished back from the Dragon Balls twice, once when his alternate timeline self is killed by Super Perfect Cell and second when Kid Buu destroys the Earth. In episode 85 of Dragon Ball entitled "Preliminary Peril", there is a man in the crowd with Trunks's hair style. During childhood, Trunks treats Goten at times as an annoying brother who he at times shows no concern for, but later in life, he treats Goten as an equal much like the relationship between Vegeta and Goku from their first run as a team, to the leaving of Goku in GT. Trunks entered the hyperbolic time chamber more than twice. His alternate timeline counterpart entered it for two days and present Trunks entered it once. It is possible that Trunks could sense ki as an infant. Whenever there was a battle and a Z Fighter began to lose he would cry even if he was miles away.